It is the all-star break, so I have three full days to explore baseball sights and take care of necessary car maintenance between Texas and Florida, before my next game in St Petersburg on Thursday. In effect, my tour all-star break began with a trip to Yale, Oklahoma to see the Jim Thorpe House. I know Jim Thorpe was more famous for his exploits as a football player and an Olympian, but he was a professional baseball player as well, notably with the New York Giants. The house that he lived in from 1917 through 1923 in Yale is open to the public as a shrine to his life. 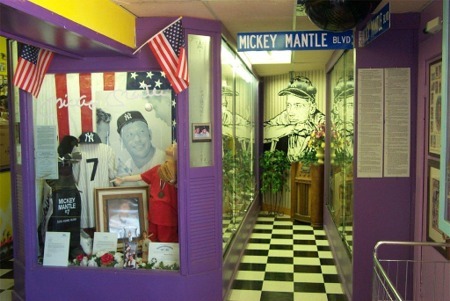 Many of his sports awards and family items are on display. The only problem for me was that when I got there, the sign indicating that it is open on Mondays-Saturdays from 10-5 had the Monday covered with a Tuesday sign and today happens to be Monday! Therefore, today I couldn’t hit the curveball and am at strike two after swinging and missing a Nolan Ryan Center fastball yesterday. The difference here is that I am much less likely to make my way back here again and will have to miss out on seeing this shrine. I figured that I might as well take care of maintenance issues after that and get an oil change for the car. I stopped at Curtis Tate Tire & Service in Grove, Oklahoma and ended up having a good time talking to the owner about my trip. Just telling people about what I was doing and getting to meet people from all over the country was a great part of this trip. The interesting part here was that he had played minor league baseball, so I was able to talk baseball during the whole time I was waiting for my car to be finished. Even when I try to step away from baseball for a few hours, I find myself drawn back in, and happily. Today, I continued to make my way East with a 5-hour drive to Jackson, Mississippi, where I would cross the mighty Mississippi and spend the day and night. The main baseball attraction for me today, is the Mississippi Sports Hall of Fame and Museum. 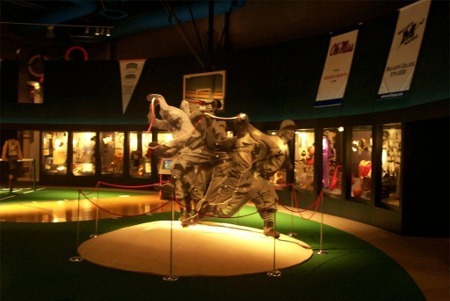 My initial target was the Dizzy Dean Museum, but that had recently closed, with much of the displays and memorabilia donated to the Mississippi Sports Hall of Fame. This was a fun experience from the start. A man named Art, who was a local resident, and a very nice and jovial man greeted me at the entrance. He was excited to hear about my adventures through the country and even more proud to show me around the museum. This museum has many interactive machines to test your skills in various sports. Since I was there on a baseball trip, Art led me over to the pitch speed machine, which was unique from others I’ve seen in the past. After throwing a pitch, you learn whether it was a ball or strike, in addition to how fast, or slow your pitch was. Art told me plenty of stories of how all the blow-hard throwers come in with tales of their high 80s fastballs, only to register in the 50s. I made no such promise, but threw a 60 mile-an-hour strike! After that, I went on to view the Hall of Fame plaques of baseball stars such as Dizzy Dean and Cool Papa Bell, the displays geared to hitters and hurlers (pitchers) and many other fascinating displays. While walking around I noticed a display on the Jackson Mets, which used to be a minor league (AA) affiliate of the Mets from 1975 to 1990 and Jackson Generals, an AA affiliate of the Houston Astros from 1991 through 1999. Both teams played their games in Smith-Wills Stadium, which is now home to the Jackson Senators of the Independent Central Baseball League. There were team photos, including many players I grew up watching play for the Mets later on in their careers. I even looked at the non-baseball stuff too. I mean, I am not just a baseball fan; I like the other sports too. I finished up with a private showing of a movie on famous Mississippi athletes narrated by Robin Roberts, which run by my new friend Art. I loved every minute of this place and nothing more than sharing experiences and stories with Art. Since It has already been two days since I last saw a baseball game, I needed a baseball fix. Luckily, for me, Smith-Wills stadium was just across the street, where a local baseball tournament was going on that I sat and watched for a couple hours. My plans from there were to sit at a bar or in my hotel and watch the 2003 All-Star game. The only problem with that was that Jackson, Mississippi does not happen to have the FOX network as one of their standard channels. I learned the hard way the FOX is not available throughout the country and that I take some things for granted in New York. Which means that during my big baseball journey, I could not watch the All-Star Game! I was relegated to listening on the clock radio in the hotel, while I wrote my notes. This was also the somewhat historic first All-Star game that would decide which league would gain home-field advantage in the World Series. Another interesting tidbit in this game was that Eric Gagne came in to pitch the 8th inning for the National League with a 6-4 lead. He promptly gave up a one-out double to Garret Anderson, a single to Vernon Wells to plate pinch-runner Melvin Mora to make it a one-run game. Then Hank Blalock hit a dramatic, two-out go-ahead home run to put the American League up 7-6, which ended up being the final score giving the American League Champion home-field advantage. Gagne did not blow a single save during the entire 2003 season, yet he was the losing pitcher of the one game I saw in Dodger stadium and he blew the save in the all-star game and took the loss. Some serious irony here, but that is the beauty of baseball. The plan today was to make the long 11-hour journey to Florida to see the Ted Williams Museum in Hernando, than the Devil Rays game in St Petersburg tomorrow. However, I decided to take an hour break by visiting Hank Aaron Stadium in Mobile, Alabama. 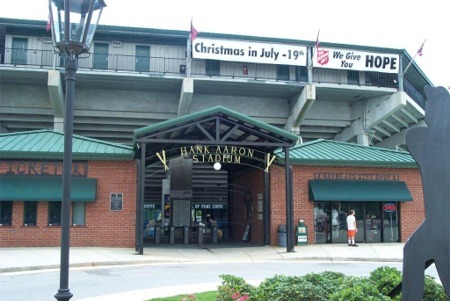 Hank Aaron Stadium is located in the hometown of the great Home Run King it is named after. It also happens to be the hometown of four other hall of famers; Ozzie Smith, Willie McCovey, Billy Williams, and Satchel Paige, and it is located near Satchel Paige Drive. 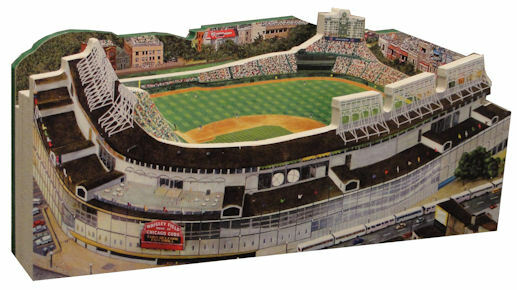 There are plaques honoring each of the five hall of famers and a great gift shop that was open, although the stadium was not. From the outside, this seemed like a beautiful old-style baseball park, which is the home of the minor league Mobile Baybears. Too bad, I was not able to see a game today; I had to drive another four hours to Williston, Florida to rest up for tomorrows activities. Bottom line – Even though I was without a Major League Baseball game for four days (including my Sunday tour of the Astrodome), I was able to enjoy several baseball experiences in the South during my journey from Texas to Florida.